Bake cookies as directed on roll or package. Cool completely, about 15 minutes. Spoon chocolate frosting into 1-quart freezer storage bag; seal bag. Cut off tiny bottom corner of bag. On each cookie, pipe frosting on outer edge of half of cookie. Arrange candy corn over frosting for feathers. Pipe orange icing onto each cookie to resemble turkey face and feet. Use orange icing to attach baking bits to turkey face for eyes. Pipe black gel on baking bits for centers of eyes. When it comes to Thanksgiving desserts, a lot of people think of pie—but we’re here to make the case for Thanksgiving cookies. If you’re just learning how to make cookies, you might assume these whimsical, on-theme treats are better suited to advanced bakers. But you’d be wrong, because these little turkeys are as beginner-friendly as it gets. Just slice and bake a roll of our famous sugar cookie dough, then decorate with frosting and candy. 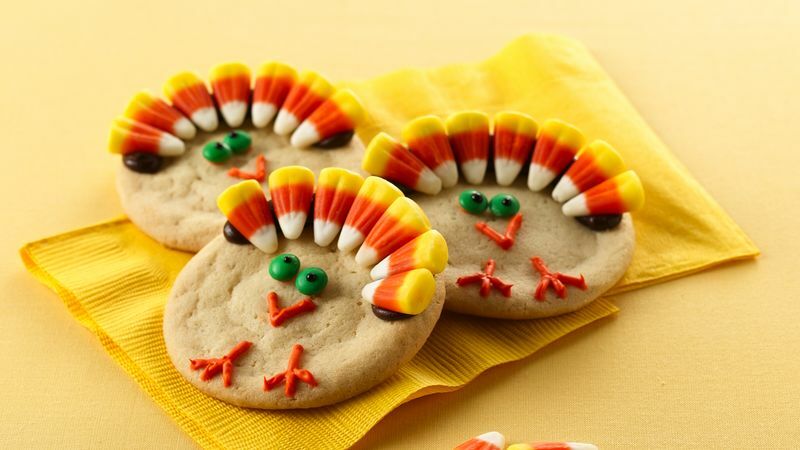 And these cute little turkey cookies don’t just taste great, they also pull double duty as décor (take that, hand turkeys!). Make a batch for a festive themed addition to your Thanksgiving table.